NEW YORK — Lawyers for President Donald Trump's former personal lawyer, Michael Cohen, say he should be spared prison for crimes he committed in an abundance of enthusiasm for his ex-boss, and they portrayed him to a judge as a hero for cooperating in a probe Trump has "regularly questioned publicly and stridently." The lawyers said in court papers filed in New York late Friday that Cohen, 52, has cooperated extensively with special counsel Robert Mueller and New York state investigators who brought a civil lawsuit against the Trump Organization and individuals, including Trump. They cited the fact he met with Mueller's team in "seven voluntary interview meetings" that began even before he pleaded guilty on Aug. 21 to campaign finance and bank frauds, among other charges, and continued through late November. He pleaded guilty Thursday to lying to Congress, a charge that his lawyers said resulted in part from information he voluntarily provided Mueller's team in meetings governed by a limited-use immunity agreement. "Michael's decision to cooperate and take full responsibility for his own conduct well reflects his personal resolve, notwithstanding past errors, to re-point his internal compass true north toward a productive, ethical and thoroughly law abiding life," his lawyers wrote. They say he'll continue to cooperate, though he wants to be sentenced as scheduled on Dec. 12 so he can return to providing for his family. Besides his cooperation with Mueller, Cohen has also provided the New York state attorney general's office with documents "concerning a separate open inquiry," the lawyers wrote. They said he also has provided information to the New York State Department of Taxation and Finance. Cohen's lawyers sought to address speculation over why their client has not entered into a formal cooperation agreement with prosecutors, saying Cohen was concerned that such a deal would delay his sentencing. "This personal decision does not signal any intention on Michael's part to withhold information or his availability to respond to additional inquiry. To the contrary, he expects to cooperate further," the lawyers wrote. "But, following the execution of search warrants in this case, nearly every professional and commercial relationship that he enjoyed, and a number of long-standing friendships, have vanished." The lawyers portrayed Cohen as courageous for cooperating in Mueller's probe while the "investigation — and the rationale for its very existence — is regularly questioned publicly and stridently by the President of the United States." "In the context of this raw, full-bore attack by the most powerful person in the United States, Michael, formerly a confidante and adviser to Mr. Trump, resolved to cooperate, and voluntarily took the first steps toward doing so even before he was charged," the lawyers wrote. "He took these steps, moreover, despite regular public reports referring to the President's consideration of pardons and pre-pardons in the SCO's investigation." They said Cohen viewed Mueller's investigation to be "thoroughly legitimate and vital" and added that he "could have fought the government and continued to hold to the party line, positioning himself perhaps for a pardon or clemency." They said he cooperated for "himself, his family and his country." Cohen has been married for 24 years. He has two children, ages 23 and 19. Cohen's lawyers — Guy Petrillo and Amy Lester — said Cohen and his family have faced threats of physical harm, which have been referred to authorities. The lawyers, in a document that sometimes referred to Trump as "Client-1," said Cohen committed campaign finance fraud and made false statements out of a "fierce loyalty" to Trump and at his direction. "Michael regrets that his vigor in Client-1's interests in the heat of political battle led him to abandon good judgment and cross legal lines," they said. In his guilty plea, Cohen confessed that he lied to Congress last year about a Moscow real estate deal he pursued on Trump's behalf well into the 2016 presidential campaign and at a time when investigators believe Russians were meddling in the election to help his candidacy. On Saturday, Russian President Vladimir Putin's spokesman, Dmitry Peskov, displayed what he said were two emails from Cohen asking for help getting the Trump Tower Moscow project off the ground. Cohen last year acknowledged to Congress that he sent the emails to Peskov in January 2016. He then spoke by phone with one of Peskov's assistants. "We told them that the presidential administration isn't involved in construction projects, and if they are interested in making investments we will be glad to see them at St. Petersburg's economic forum," Peskov, who was with Putin at an international summit in Argentina, said Saturday. He flashed the emails on his phone to reporters, in an exchange broadcast on Russian state television. Cohen told Congress that he killed the proposal after talking to Peskov's office, which was a lie. 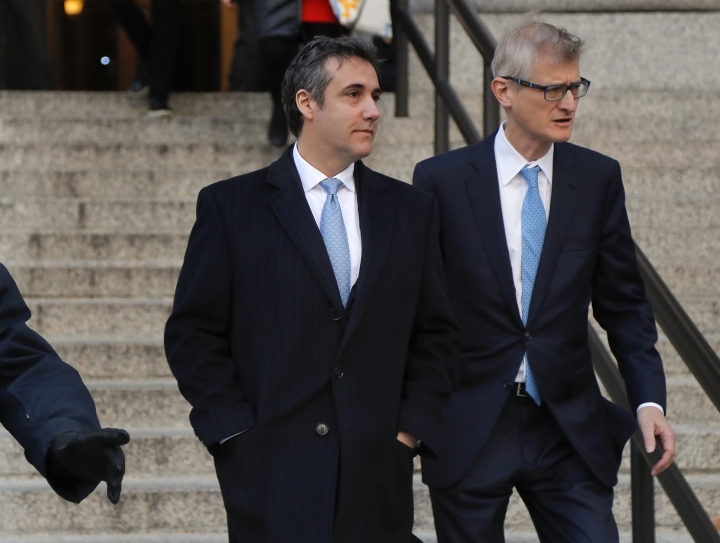 Cohen's lawyers said prison would be inappropriate given hardships Cohen faces, including loss of his law license, Internal Revenue Service civil penalties and restitution, his likely inclusion as a defendant in a tax case by New York State, the loss of his consulting firm's business and the cancellation of numerous banking credit card and insurance agreements. Included in the defense submission were over three dozen letters from Cohen's friends and family. In one, former New York Giants punter Steve Weatherford said he thought so highly of Cohen that he gave him the special teams game ball after the Giants won Super Bowl XLVI over the New England Patriots in 2012. In another, a woman wrote that her husband, who is Syrian, had been friends with Cohen since 1984. She said that when Trump made derogatory statements about Muslims during the 2016 presidential campaign, Cohen asked the couple out to dinner "to apologize for his hurtful comments, distancing himself from the public position, and even expressing his shame and his children's embarrassment at his association with such a view." Prosecutors have not yet filed a pre-sentence submission but have agreed to note Cohen cooperation to the sentencing judge.